Plugin “Show Mark Preview” is not previewing for mark to mark. it works only for mark to base. Do you have all anchors set? And which glyphs are you previewing? Edit: I made some changes last night. Make sure you have the latest versions of both app (enable cutting edge versions) and plugin (uninstall and reinstall). The plug-in only checks if its category is Mark, no matter which subcategory. Which glyphs are you using? I would like to be able to reproduce the problem, otherwise I cannot fix the issue. You can use a Unicode only once. I still cannot reproduce it. Edit: thanks for the font, just received it in dm; will have a look. I had a look at the file. The plugin cannot preview mkmk because the marks in question are lacking the necessary anchors. 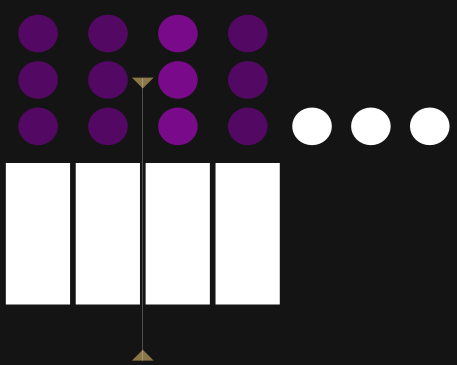 For building and previewing mkmk, the marks need both a _bottom and a bottom anchor for the next mark to connect to. I am using botnukta to connect. I have adding botnukta n _botnukta in both marks. I checked again. In the file that I received, all the marks only had one anchor each, either _bottom or _botnukta. Adding bottom anchor makes it work as described. Any particular reason for botnukta instead of bottom? At first glance I see no reason for a separate anchor chain. Also no base letter has botnukta. You can keep the marks with a width and positive sidebearing values. Makes editing way easier. They will be exported with zero width anyway. If I use bottom is defined in knJA and _bottom in knJAc2, then I would need to use the same mark to mark approach for all below form and sub. Right now it is functional all below form and below sub is functional with space combining. I want to use only mark method for nukta. Is it a wrong approach? It works with Harfbuzz, when I output it. Can we get this to preview with plugin please. Not sure I get it. What would break if you switched them all to simply bottom/_bottom? You never have both concurrently next to each other in the same glyph anyway, do you? and then another mark with an underscore anchor that connects to that different name. all letters have bottom mark, I don’t want that to happen. I want to use spacing for it. It’s not needed in open Type feature, I suppose. It’s working in the final font. It should not connect to anything? Two ways to deal with that: (a) define it as letter (select it in Font tab, and press cmd-opt-I) or (b) take out the underscore anchor. (a) it is not an option. I need it as mark in definition, to allow ignoremarks in certain feature. (b) It is working in final font, when I add both anochors botnukta and _botnukta in both the marks and not bottom anchor in either. I have checked in both Harfbuzz(chrome) and Coretext(Safari). Show mark preview plugin is not previewing. Its Ok, I can deal without the preview for this one. Request: Please advise if this is a bad approach by definition. and if you think this is working in final font by chance. Not sure, but I guess it is OK. I would do a lot of testing, not only in browsers. If it works, it works. If it doesn’t, expect a lot of support mails. I am collecting test cases in web pages. I am planning to test in IE, Edge, Chrome, Safari (in mac) is it not sufficient? do I need to test all my cases in word processors also? Also, abvm, blwm, are written during exporting by glyphs. Is it possible see it before exporting? No, that is not possible because the pos values are interpolated. Export and inspect features.fea in the Temp folder of the respective instance.